Repeater is Work in Progress. Operational TX 24/7 Omni Slot. As an update of GB3JT, it has unfortunately been a bit a journey in time getting the repeater up and running due to life, a number of jigsaw pieces and also working party access to the school tower block roof, out of term time for site safety. 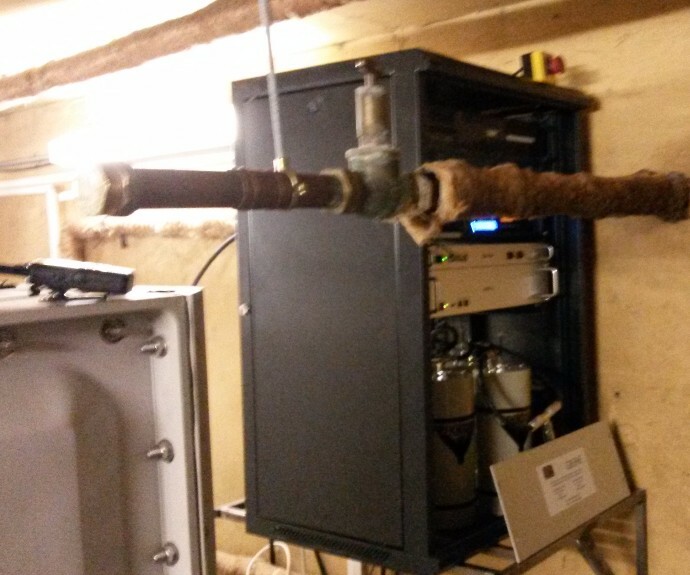 The main part has been replacing the rack cabinet on site with a larger version to accommodate the repeaters (GB3HE, GB7HE (DSTAR), GB3JT (DATV) and also MB7UE (APRS)), plus preparing the 2nd mast for the new DSTAR repeater and 23cm ATV antenna. Due to the site exposure to WX elements, GB3JT's antenna was originally going to be an Alford Slot in a sealed radome but after testing an Angled Slot (based on Dave G8ADM design), this appeared to be the better overall option and so after a few tests, rugged versions were made/tested and finally one was enclosed in a home made radome ready for site. Hopefully this will prove OK, once fully on air we shall see. 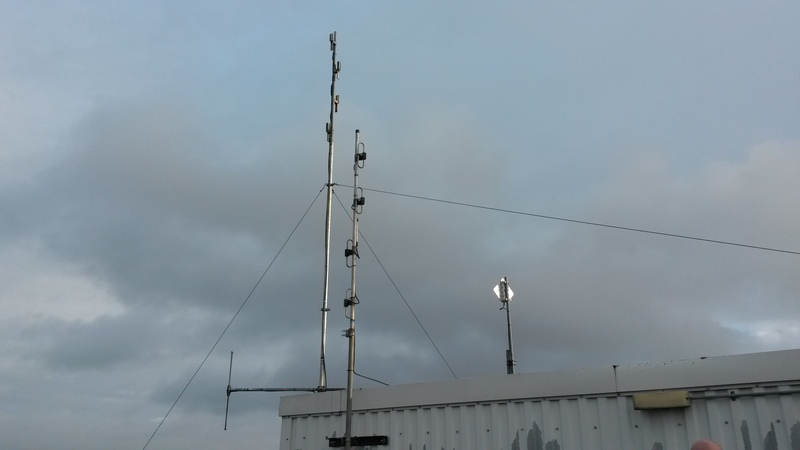 The slot antenna and heliax installation was due to go to site just before Christmas, whilst the working party were also updating GB3HE and installing GB7HE but the weather was unfortunately against us. We were also hindered in getting the wireless bridge installed for internet access (which we need for Echolink, DSTAR, RadioReference and DATV), so these works are now planned as soon as we can during January. Hopefully now that my workshop is clear of recent works to GB3EB, GB3HE, GB7HE, we can get momentum on GB3JT and get it in the air as soon as possible, even if its in beacon mode to get some signal reports. The longer term plan for GB3JT is both digital and analogue in, with digital out, streaming and 24/7 operation (active and test cards), in order to encourage clubs and individual ATV projects and development. View from the roof, antennas another 20' higher! Shame you couldn't locate at the pub at beachy head ...ideal club house as well . The thought of using beachy head could be good but in reality its too damn high Even mobile phone signals struggle on top due to the shadows, unless you go 'roaming'. Long distance operation maybe good, Butts Brow is a super example as a site, but even then 3VX coverage is not great considering where it is due to the downs and shadows. Guess its all a compromise at the end of the day and a mast another 100' plus in the clear is a dream. Quick update. the GB3JT Digital ATV transmitter is shaping up well and running endurance tests prior to going to site where it will be in permanent TX, Beacon and RX mode, so need to ensure all running OK where possible. Overall plan is to get partly operational for the SERF event (Eastbourne Rally), in June, even with basic logic, then the second phase will be to add more functionality and improvements as we learn more on coverage etc. The repeater will eventually have auto switching Analogue and Digital Receivers, with Digital TX. The angled slot is already on the main mast and poised for some RF... A stream is also in throws of being setup direct from the on-site PC. With the DATV 23cm repeater now on main site in Hastings and in 24/7 TX Beacon mode (during coverage trials), would be interested in any reports please. Output 1318 MHz DVB-S 4 Msymbols 1/2 FEC - Omni directional Angled Slot on top of the tower block mast. Plan to go to site during half term next week to add RX and basic interim logic in time for the SERF - Eastbourne Rally on Weekend of 4th and 5th June. Further updates to then follow when more time is available post the rally. GB3JT TX and PA, WIP cased and on soak test. Have been asked about the antenna. This is an angled slot made out of brass plate and mounted within a tube. It is then mounted on top of the main GB3HE four stack mast, on top of the school tower block - so well in the clear.